Großarl is a community in Salzburg with approximately 4,000 residents. It is a market town and situated some 70 kilometres of Salzburg city, in the district of St. Johann, also called the Pongau. Großarl is located on a plateau surrounded by various high mountains. It is famous for its excellent skiing opportunities and a major tourist destination during the winter season. During the summer, the Großarltal valley is one of Salzburg's finest hiking destinations. The Großarltal Valley was rather underdeveloped for a long time; the tourism infrastructure such as ski lifts, hotels and other facilities was developed mostly after 1960. In the 1970ies, the tourism board of Großarltal formed an alliance with the Gasteinertal Valley and a new skiing area was born: The Skischaukel Großarltal-Dorfgastein, a major player of the skiing industry in Salzburg ever since. Only after this coalition was formed, tourism flourished and prospered. The skiing area is now part of the Ski Amade and has 80 slopes, five cable cars, eight chair lifts and five cable lifts carrying up to 29,000 people an hour at maximum capacity. The altitudes of the skiing area range from about 885 metres (Großarl itself) to the peak of the Kreuzkogel at more than 2,000 metres. Today, Großarl has hotels and B&Bs catering for up to 4,500 guests at a time. Most hotels are medium to high-end with four starts being the typical category. The popularity of Großarl during the winter is in contrast to the summer season, where some 40 mountain cabins draw some hiking tourists into the valley - but nothing compared to the winter. In terms of sightseeing, opportunities are limited. In the mountain cabins, locals often organise somewhat folkloristic cheese or butter making sessions. Otherwise, note the Baroque parish church of Großarl. Following the course of the Großarler Landesstraße, the main road into the valley, you will pass a building called "Stegenwacht" or "Alte Wacht". This house was home to public guards and served as a toll station. It is the oldest toll station in Salzburg and charged taxes on goods (especially food) that was exported from the valley - to keep prices for food low inside of it for the sake of the residents. In 1655, the guard house even closed traffic between the Großarltal and the "outside world" altogether - the Bubonic plague had arrived in Salzburg. Crossing the Großarler Ache river at the Alte Wacht, you will get to the so-called "Heidenlöcher", a set of five caves. According to legend, pagans lived in these caves after the arrival of Christians. It is quite likely that the caves served as illegal congregation venues for Protestants in more recent times (17th century). Such "wild churches" can be found all over Salzburg′s mountains. A more impressive sightseeing attraction of Großarl is the nearby Liechtensteinklamm. This gorge is one of Salzburg′s most beautiful ones - the steep walls are up to 300 metres high from the bottom. In the late 19th century, the Prince of Liechtenstein funded the construction of paths and bridges that were opened in 1875 - the period when tourism started to develop in the Austrian mountains. It is open from early May to late October, typically between 8 am to 6 pm. Bring hiking boots or proper shoes. Parking lots and nearby inns are available. 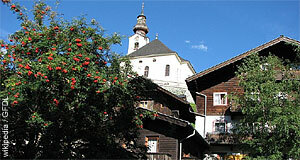 Note also nearby St. Johann with its large, 19th century church.